The RBNZ announced that it was maintaining the OCR at 2.25%, sending the Kiwi higher across the board. What’s up with that and where will the Kiwi go from here? Does the RBNZ’s most recent statement and presser offer any clues? Well, find out by reading up on the key highlights of the June RBNZ statement and presser. 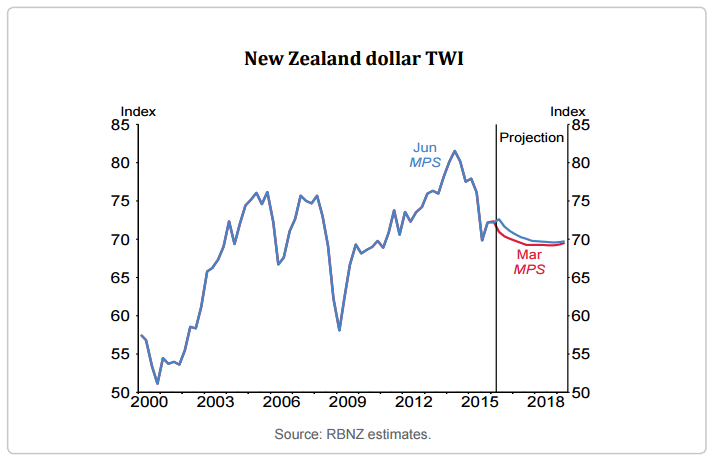 Wheeler didn’t miss a beat and repeated his mantra that the Kiwi dollar “is higher than appropriate given New Zealand’s low export commodity prices.” Interestingly enough, he also said that the RBNZ expects the Kiwi’s TWI (trade-weighted index) to depreciate over time. Hmm. How come? Oh, for the newbies out there, the TWI is, well, an index of the Kiwi’s performance against a basket of 17 currencies that are weighted based on their level of trade with New Zealand. The RBNZ updates it daily, and you can get it here, if you’re interested. Getting back on topic, the details of the June Monetary Policy Statement shows that the RBNZ blames the Kiwi’s recent strength mostly on the “the improvement in risk appetite in financial markets since the time of the March Statement,” which made the higher-yielding Kiwi more attractive. However, the RBNZ assumes that the U.S. Fed would be hiking rates soon, which it hopes would increase demand for the Greenback while weakening demand for the Kiwi in the process. The RBNZ also hopes that “global economic conditions improve, allowing trading-partner growth to continue at around its average rate,” which would then create demand for those trading-partners’ respective currencies that would hopefully ease demand for the Kiwi. Wheeler was asked about the persistently strong Kiwi, as well as his thoughts on the Kiwi’s surge when the RBNZ announced that it maintained its monetary policy, and what tools he had to address the Kiwi’s strength during the RBNZ press conference. Wheeler noted that the RBNZ has a so-called “traffic light” system for intervention, though, but the RBNZ will only use such a system when really absolutely necessary and only during times of limited liquidity when an intervention can be most effective. As for using rate cuts to weaken the Kiwi by scaring away foreign investors, Wheeler stressed heavily that future rate cuts (if any) would be data-driven, but he also said that the RBNZ “won’t hesitate to adjust interest rates” in order to “try and move the exchange rate” if needed, so yes, the RBNZ can and will use rate cuts to weaken the Kiwi if needed. The RBNZ expects “inflation to strengthen reflecting the accommodative stance of monetary policy, increases in fuel and other commodity prices, an expected depreciation in the New Zealand dollar and some increase in capacity pressures.” Specifically, the RBNZ expects CPI to rise by 1.5% year-on-year by Q1 2017, which is a bit faster than the previous projected rise of 1.3%. Higher inflation expectations means that the RBNZ will be less likely to cut further. But do note that one of the RBNZ’s assumptions for its upgraded projection is “an expected depreciation in the New Zealand dollar,” and I already talked about what the RBNZ’s assumptions are for a drop in the Kiwi dollar to take place. Okay, but what does the housing market have to do with monetary policy you, ask? Well, cutting rates further would make borrowing money cheaper, which may encourage even more housing demand because, as Wheeler puts it, “there’s a perspective among New Zealanders that house prices will always go up.” To add to that, housing loans in New Zealand, especially in Auckland, are highly-leveraged, which increases the risk of a housing bubble, so the RBNZ is likely wary of cutting rates further. If those factors improve, then it’s possible that we won’t get another rate cut, but if those factors deteriorate, then Wheeler said that we can expect a rate cut, maybe even more if things get really bad. Overall, the RBNZ is still a bit dovish and is even open to further rate cuts if needed. The RBNZ was also concerned with the Kiwi’s recent strength. Still, the fact that the RBNZ refrained from cutting rates probably convinced forex traders who were betting on a rate cut to abandon ship. Not only that, the RBNZ’s jitters over the housing market likely enticed traders who were on the sidelines to buy up the Kiwi on lower rate cut expectations, since cutting rates further would only worsen the housing market issue. The Kiwi then got another bullish boost during the RBNZ press conference, likely because Wheeler admitted that an intervention is unlikely and probably won’t be very effective, which is a good go-signal as any for the Kiwi bulls to load up some more. Do note, however, that the RBNZ is actually expecting the Kiwi to depreciate over time, and a weaker Kiwi is one the factors for its upgraded inflation expectations, as I already talked about earlier. What do you think? Do you believe the RBNZ’s forecast that the Kiwi will drop? Or do you think that most forex traders will just ignore the RBNZ and continue buying up the Kiwi until the RBNZ is forced to cut again or intervene (for what it’s worth)? Or maybe you don’t really have a bias at the moment. Share your thoughts by answering the poll and/or commenting below.